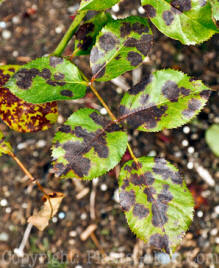 Black spot is a fungal disease that can cause serious damage to many types of roses. Hybrid tea roses seem to be especially susceptible. As the name implies, this disease appears as dark spots in the leaves that may grow together. Once enough of the leaf tissue is infected, the leaf will turn yellow and drop off. In severe cases, the plant may lose all its foliage by mid to late summer. Additionally, there may be spots on branches and twigs. Spots form on the leaves and enlarge into large, dark circles with irregular margins. Several spots may grow together. As spots increase on a leaf surface, the leaf generally turns yellow, then falls prematurely. In addition, similar dark lesions form on twigs and rose hips. Infected plants are stunted with unsightly foliage and produce fewer, paler colored flowers. A severely infected plant may be entirely defoliated by midsummer. Since this is a fungal disease, it spreads by spores. They blow into the air or are splashed in water from last year's leaves and infected stems. Infections are generally much more severe if the spring is warm and moist. One source of this disease is the spores that form on the previous season's leaves and infected twigs. Therefore, one prevention technique is sanitation. Clean up all the leaves and infected canes at the end of the year and dispose of them away from the garden. As always, try to find black spot resistant cultivars of roses to plant. This is especially true when choosing hybrid tea roses. Fungicides - commercially available fungicides are labeled for control of black spot on roses. These products have to applied before the infection occurs. Most rosarians who use fungicides need to reapply them periodically through the summer. That can be a lot of work. Sanitation - as mentioned above. Irrigation - make sure sprinklers do not wet the foliage frequently. In order for the spores to survive, they must be in a moist environment. If you need to irrigate, direct the water toward the roots and not onto the foliage. Home Remedies - There are many home remedies that people us to try to prevent black spot. Some people swear by them while others swear at them.